Before he was a Jedi Knight he was a pod racing slave. 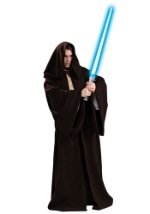 Now you can get the accessory that will complete any young Anakin costume! This decorative neckpiece is made out of small plastic beads and has 2.5” long plastic pieces that hang down. This replica will add that extra detail that makes a good costume great.